Legendary classical thrash/speed metal act FLOTSAM AND JETSAM have announced their new album – No Place For Disgrace – 2014! No Place For Disgrace – 2014 will be released on February 14th in Europe, 17th in UK, and digitally 18th in North America. The physical CD will be available in North America on March 4th. 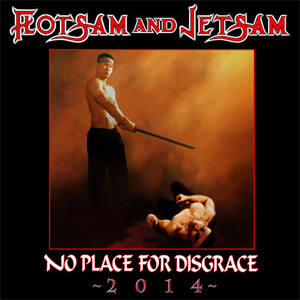 Fans can listen to "P.A.A.B", watch videos, and pre-order No Place For Disgrace – 2014 at www.metalblade.com/flotsamandjetsam. FLOTSAM AND JETSAM comments: "We have re-recorded No Place For Disgrace because we have had a lot of requests to remix this record. The master tapes have been very difficult to obtain so we decided to re-record the album and use some of today's technologies to recreate it. The aim was not really to change but to enhance it with the opportunity with the use of new tools. We have the time available as well and it just seemed like a no brainer. A lot of the die hards are really nervous about it but I think after the final result they will embrace it. The sound quality is 100% better and more refined!" FLOTSAM AND JETSAM will be heading over to Europe in February to support SEPULTURA and LEGION OF THE DAMNED! The tour begins on February 7th. In April of 2013, Metal Blade released Ugly Noise, the band's eleventh full-length album, their first release on Metal Blade since 2001, and the follow up to their 2010 album, The Cold. The record also marked the return of original members Michael Gilbert on guitar and Kelly David Smith on drums, who had not recorded with FLOTSAM AND JETSAM since High in 1997. To purchase this album, as well as FLOTSAM AND JETSAM merch, visit indiemerch.com/metalbladerecords.